The following portrays different manufacturer statements of how fall distance should be calculated. First, add the length of the shock-absorbing lanyard (6 ft.) to the maximum elongation of the shock absorber during deceleration (3-1/2 ft.) to the average height of a worker (6 ft.). Then, add a safety factor of 3 ft. to allow for the possibility of an improperly fit harness, a taller than average worker and/or a miscalculation of distance. In a real world situation, the Dennington system allows a lower tie off point and basically combines both free fall and deceleration distance for a total 6 ft fall distance, period. This is the original minimum fall protection standard which did not allow the extra 3 ½’ elongation because it would clearly let you contact the lower level. It is common knowledge throughout the fall protection industry that manufacturers instruct you to tie off over your head and calculate fall distance as shown in the above pictures. Over the head tie off points do not exist in a fair amount of instances such as an ironworker on top of a structure being built or workers performing duties inside an aerial lift. With the Dennington system this calculation is no longer needed. You do not need to calculate fall distance and deceleration distance nor add a safety factor as this system will keep you within a six foot fall distance each and every time. The first two pictures are misleading in more ways than one. They do not show true distances (ten ft increments between floors) since in the first picture, the lower level isn’t portrayed although a higher level is shown as a tie off point. It is unrealistic to believe that any worker can reach up and tie off to a higher level. For example, if you were to stand up in your office could you reach through the ceiling and hook off to the next level? A standard drop ceiling is 8ft between floor and ceiling with 2ft of clearance between the ceiling and the next floor. The tie off point portrayed is a fictional point. 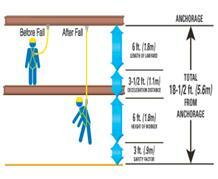 Although the lower level is portrayed in the second picture, it is also inaccurate as a worker would not be able to stand on one level and reach up to tie off to the other. All other manufacturers fall protection instructions say that if you’re not tied off over the top of your head, you’re not in proper use and in most instances, there is no way to be properly rigged which is a recognized hazard. With the Dennington Safety harness there is no over-the-head tie off requirement and it eliminates more recognized hazards (violations) than you can count on two hands versus any other fall protection system. With just our first recognized hazard that can be eliminated (falls to a lower level), the Bureau of Labor Statistics figures show the following: In the last ten years, between 2003 and 2009, there were 361,720 injuries to American workers in the U.S. due to falls to a lower level. Furthermore, there were 3,259 deaths to U.S. workers, due to falls to a lower level, in that same time period. 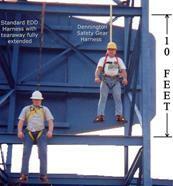 See the CBS video for a demonstration of the new technology at www.DenningtonSafetyGear.com.